Yes I read it, the breeder loves their parrots, I guess it pretty normal to hand feed your parrot in SA. Although I think they feed the birds formula with a spoon not a syringe. Types of Birds Owned: White fronted amazon. Hey Kyle, yes handfeeding is more common in your part of the world than here in the states, when i lived in CA/SA in the 70s there were no breeders, if you wanted a parrot youwent to yhe market and bought a wild caught baby or collected your own, i feed mine cream of wheat cereal from a spoon.i usually tried to pick babies with pin feathers as the older ones seemed wilder. There's a world of differencs between domistic birds and wild birds, however my point is that having weaned your own baby will not mean that it will bond with someone else, baby parrots don't leave the nest they're driven off my their parents(not very pretty to watch)and yes most amazons mate for life but many don't , If you take away their mate many will take another and some will change mates on their own, who knows what drives a bird to bond with another bird/person. Even in the wild male/male and female/female pairs are not uncommon. As for amazons 12wks is about right for normal babies to wean, in the wild 12wks would be a long time but we have messed with mother nature when raising 2nd/3rd generation caged birds and many breeders will keep hand feeding babies for months and months in an effort to keep them tame with a of minium interaction. Pchela wrote a very informed and accurate thread. There is no substiute for exprience when hand feeding babies but it sure is a wonder of life to watch. The thread killer has struck again. Awwww... you aren't a thread killer! And I appreciate the vote of confidence in your previous post. It's nice to have your ideas backed up by people who know their stuff. This thread tends to stay pretty quiet anyway. Had to add - I've had parrotlets and Indian ringnecks turn on me literally the very day they wean. Turn very aggressive and wanted nothing more than my blood; but they were complete sweethearts with everyone else in my family and to strangers. Doesn't happen with any particular frequency and I haven't figured out what I do different (if anything) with these babies. The first time it happened to me was w/ a little parrotlet. I thought that I wouldn't be able to sell her as a pet, but she jumped straight onto the person who came to see her and was a complete perfect little lovey doll. So, absolutely handfeeding is not necessary for bonding. Types of Birds Owned: sun conure, parrotlet, cockatiel, african greys, eclectus, sun conures, jenday conures, indian ringnecks, parrotlets, bourkes. 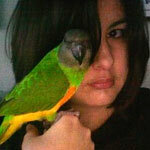 patdbunny wrote: I've had parrotlets and Indian ringnecks turn on me literally the very day they wean. Turn very aggressive and wanted nothing more than my blood; but they were complete sweethearts with everyone else in my family and to strangers. Hmm. Now that's something I find really interesting! So I have a question... I'm told my GCC is about 7'ish weeks old and is still being weaned. He doesn't seem to have any interest in solid food at all at this point, and is still at the store being hand-fed. I've been going in once/day to give him one of his feedings and stay and cuddle with him for a few hours afterwards. Should I stop feeding him and just cuddle and play with my baby if I want him to bond with me? I'm really curious now. Thanks bunches! And whenever possible, please consider adoption before you buy from a breeder. There are soooo many homeless birds out there just looking to be loved and the numbers grow each and every day. I used to breed GCC and maroon bellies. I never had one of those "turn on me" when they wean. What I did notice in those conures is that they lose their tameness relatively quickly if they're not handled regularly after weaning. Back when I was breeding those I was working full time so I was selling the babies to a friend who owned a pet store. He left them in cages with no handling and in about two weeks they acted like they were never tame. Since you're probably going to take your baby home right after weaning and will be interacting with it regularly, I don't think you have much to worry about. 7 weeks and not really interested in weaning's pretty normal. I wouldn't expect him to wean until about 10-12 weeks. If you want to encourage weaning, you can soak some pellets in warm water and finger feed him instead of giving him formula feeding by spoon or syringe. I like the Kaytee pellets for soaking as it doesn't really turn to mush. @Pat - Thanks for the feedback, it's reassuring to hear. I was told yesterday that s/he should be ready to come home in 2-4 weeks, and according to what you say, that sounds right. I may buy some Kaytee pellets to take in and feed him while I'm visiting and see how that goes. I've read so many horror stories about bringing babies home before they're ready, I don't know if I want to try and hurry things or not. Oh well, we'll see. Either way, I'll have my sweet baby for a long time! Oh, and I'm sorry it took me so long to get back to you. I haven't quite figured out how to navigate this forum yet and forgot I'd even posted a comment. No, don't hurry it. Bird's aren't like cats, dogs, horse where you "wean" them at X age by taking them away from their mother and they're just fine. Baby birds if force weaned or go home too early sometimes revert and "forget" how to eat. They don't really forget, but they get super emotionally needy and won't eat. I don't send home a baby until it's been eating solidly by itself for 2 weeks with no handfeeding. With that said, you're not going to psychologically hurt or hurry the baby if you finger feed the warm softened pellets. Finger feeding right now might be a good idea as a transition so when it gets to your home it's familiar with you finger feeding and you can easily introduce new foods by finger feeding when you get the baby home. Keep in mind - it's normal for the baby to get to its new home and start "begging" or baby whining. It will outgrow that in a few weeks to a month. Watch it and make sure it's eating and drinking. So long as the begging and whining noise is not really fast and desperate sounding the baby's ok. I know that's going to be hard for you to tell if you haven't heard a bunch of babies crying. But the next time you go in and play with the baby observe its begging - when you're playing with it or after handfeeding it, it may have a slow, "ah, ah, ah" begging sound. Then take notice of right when you bring the handfeeding formula to it and start handfeeding the formula, the begging noises become louder and more frantic - that loud frantic is what you really don't want to hear when you get the baby home - a few seconds maybe - but not continuous loud frantic once the baby's home with you. No covered feeding bowls for the first month. I suggest putting food and water bowls on the bottom of the cage so it's really easy to find. Newly weaned babies are not rocket scientists and may not go climbing around the cage looking for the food and water. You can also have fresh foods in your hand when you play with the new baby when it's begging and start encouraging exploration of new and different foods.